BIG RALLY IN VIRGINIA FEB 5TH – PLEASE SHOW THEM THAT WE CARE ABOUT EQUALITY! We are NOT going to wait any longer. 2019 is the year we will complete ratification of the ERA! 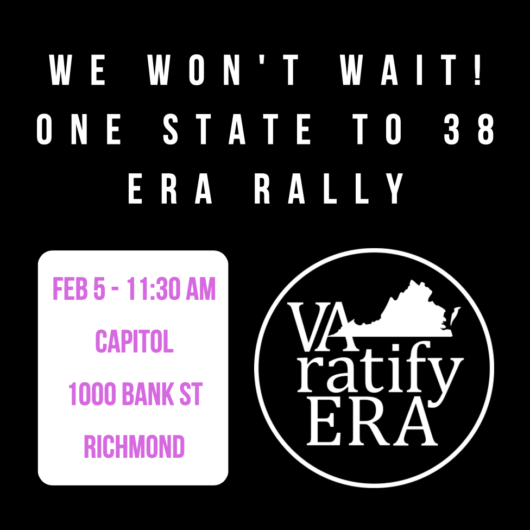 This Tuesday February 5, @ 11:30 AM please join us for the “One State to 38 ERA Rally” in support of the Equal Rights Amendment. A portion of the rally will feature stories of everyday experiences of inequality. If you have a story you’d like to submit, please do. VA Ratify ERA is especially looking for stories related to pay inequity and discrimination. All ages welcome to participate / submit stories for consideration. 1) Virginia was promised a fair and full hearing on the ERA. Instead they got a sham assignment to a subcommittee. The Chairwoman, a junior Delegate, lectured the audience on how gender discrimination didn’t exist and that she didn’t “need words a sheet of paper.” because “God made us all equal,” She then further discredited herself and the hearing by attacking an advocate in the audience, whom she had never met with. We won’t let Speaker Cox hide behind 4 votes in a subcommittee meeting on legislation as important as the ERA. That is not democracy, and the Virginia Republicans needs to deliver on the full and fair hearing Virginians were promised. 2) Despite Del Mark Cole’s attempt to block the ERA, it’s not game over. P&E voted against adding one of the House ERA versions to their agenda. However, the resolution could still be pulled out and sent to the floor for a vote AND the bipartisan Senate version is alive and well. It’s the one to watch because it has already survived cross-over.